To petition the Department of Justice through the FBI Cyber Crime division, terrorism and transnational organized crime units. For the investigation and prosecution of terrorism through gang stalking and directed energy attacks on the global population. Are you/do you believe that you are a Targeted Individual? Federal Bureau of Investigation the FBI must know in order to help you. Please indicate in Form on the right toolbar! A threat to every individual on Earth. This is not futuristic it is happening NOW! 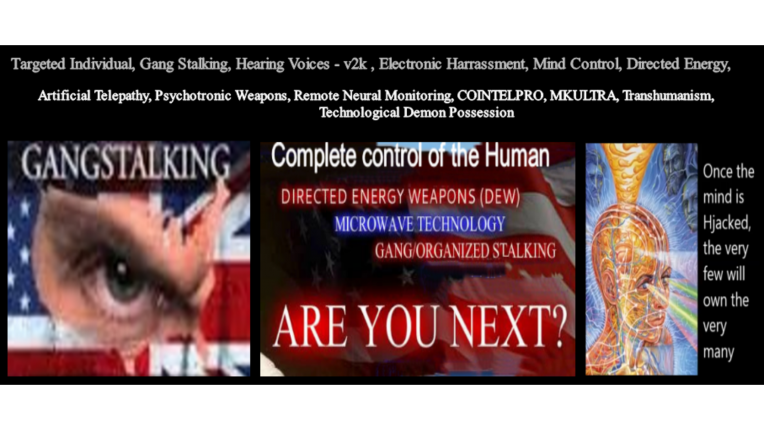 With the number of the Targeted Individual victims of Gang Stalking, Directed-Energy Weapons that can control both the mind and body men and women all over the world are being controlled and tortured by these technologies daily. Worldwide terrorism of the global human population is now happening by directed energy. It is much more than mind control, it controls both its movements and bodily functions. This technology has the potential of being the most terroristic device ever invented. These technologies that control the human flesh and mind are controlled by many handlers around the world. The system must be overhauled and restructured to ensure the safety of the general population of earth and the sovereignty of our individual governments around the world. The mind is a set of cognitive faculties including consciousness, perception, thinking, judgment, and memory. It is usually defined as the faculty of an entity's reasoning and thoughts. It holds the power of imagination, recognition, and appreciation, and is responsible for processing feelings and emotions, resulting in attitudes and actions. Now imagine the reality that exists today, the world where we are not in control of our own brain. Who or what would we be? Your entire existence can be stolen and controlled by software, controlled by anyone from anywhere on Earth. The threat the world faces due to these technologies can not be overstated, in form of espionage or terrorism. Please, everyone, sign the Petition. Please remember to request the "Cyber Crimes Division" for Terrorism and Transnational Organized Crime. The Targeted Individual victims of Gang Stalking, Directed-Energy Weapons petition to FBI Cyber Crime Division and U.S. Department of Justice was written by Targeted-Individuals-Petition-to and is in the category Human Rights at GoPetition.